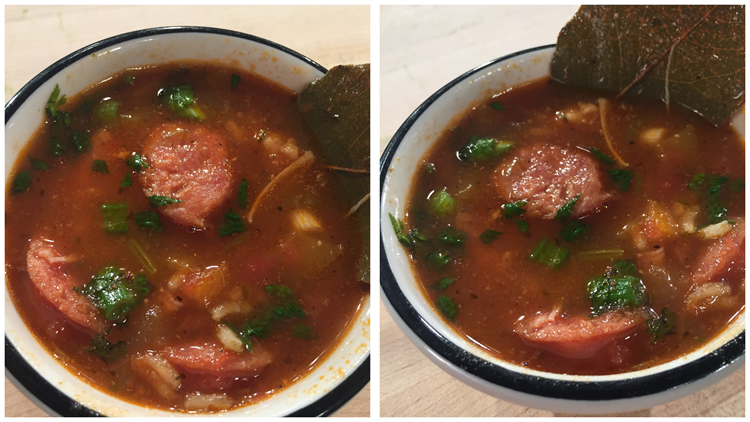 Chef Kevin Belton's delicious jambalaya soup will keep you warm even in ridiculously cold weather. NEW ORLEANS — Over the course of its 300-year history, New Orleans’ cuisine has been one of its greatest gifts to the world. Now, as we celebrate the city’s 300th birthday and WWL-TV’s 60th anniversary, our gift to you is a free e-cookbook, with 'Family Favorite' recipes. If using fresh herbs, tie them in a single bundle. Set aside. If using dried herbs, reserve them for later. Heat oil in a large Dutch oven over medium-high heat. Sprinkle chicken with Creole seasoning liberally and cook until brown. Remove it from the pot to a plate. Then cook sausage until browned. Remove it from the pot to a plate. Add onion, bell pepper and celery. Sauté until onion is translucent, about 4 minutes. Add green onion and garlic, cook 1 more minute. Pour in chicken stock. Bring to a boil, reduce heat. Scrape up brown bits on bottom of pan. Return chicken to pot. Add sausage, tomatoes, paprika, bay leaves, and herb bundle or dried herbs. Add more if desired. Add more stock if needed to fill the pot. Taste and adjust for salt/pepper. Simmer over low heat, stirring occasionally for at least 30 minutes. After 30 minutes, increase heat to medium and add rice. Cook for 20-30 minutes stirring often so the rice does not stick to the bottom of the pan. Turn off the heat. Take out herb bundle. Stir in chopped parsley. Note: If using cooked rice stir into pot 10 minutes before serving. If you would like you can also add one pound of shrimp and add it 10 minutes before serving.